To run this program, just invoke 'kuper' from the DOS prompt. 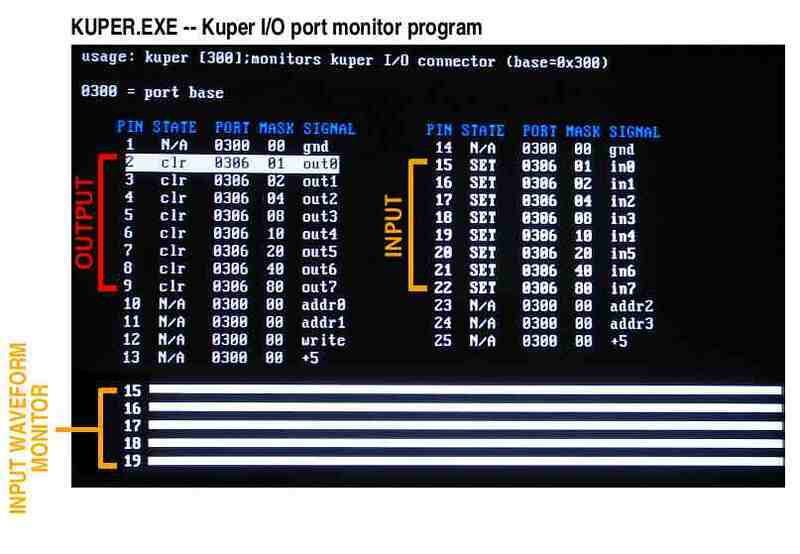 This program monitors the Kuper Logic Port's DB25 input and output pins. The 'State' column shows the real time input state of the bits, and a scrolling 'oscilloscope' readout at the bottom shows the first 5 pin's input states. You can move the cursor (the white block) between the input and output pins; when it's sitting on an input pin, the speaker beeps when the input is set, and is off when clear. When the cursor is sitting on an output pin, the ENTER key will toggle the output's bit state. Hit any key to exit this program. The kuper.exe program should be part of your OPCS installation. If it's not, you can download it from http://seriss.com/opcs/ftp/.